The International Space Station is almost done. This is Rassvet, one of the last three modules to be installed. It was shown today in Florida, and will travel to space in the last flight of the Atlantis. Rassvet is a mini research module (MRM1) that will be connected to the Russian segment of the station, facing the nadir port of Zarya, the first component that was launched in November 1998 on board a Proton-K rocket. 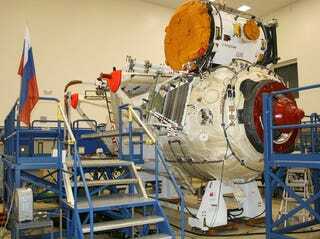 According to Mikhail Kashitsyn, the Deputy Technical Manager for the MRM 1 Prelaunch Processing, it "will be utilized for scientific research, cargo stowage, and also to provide an additional docking port at the ISS." It will also provide with one extra docking dock for another Soyuz or Progress spacecraft.